An Iranian military leader on Tuesday threatened to open the "gates of Hell" on the U.S. military if the Trump administration moves to attack Iranian-backed forces in Iraq, according to new threats that come on the heels of the Islamic Republic declaring that it will not engage in direct talks with President Donald Trump. Iran has amped up its military rhetoric, threatening the United States directly in recent weeks as the Trump administration readies new sanctions expected to cripple the Iranian economy and further fuel ongoing popular protests against the hardline regime. The new threats against the United States come as Iran unveils advanced military hardware, such as missiles and drones that are being used against American forces and their allies in regional hotspots such as Syria, Yemen, and elsewhere. 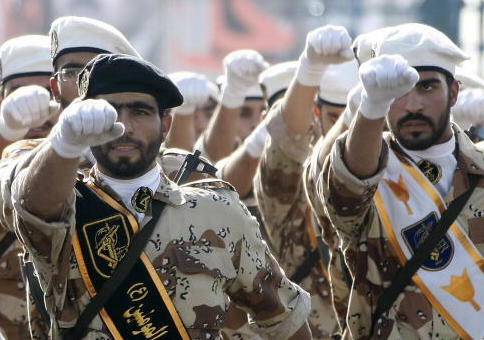 Iran has been testing the United States's resolve with a slew of attacks by its regional terror proxies in a bid to possibly lead America into a wider regional war with Tehran's allies. The ongoing feud between the United States and Iran has also taken center stage in New York City, as the United Nations General Assembly kicks off this week. Iranian-backed forces in Iraq have made major inroads, not just in the country's divided military, but also in the newly elected government, which contains many officials loyal to Tehran. In the last several weeks, Iranian forces have launched missile strikes in the heart of Iraq near the U.S. consulate and American officials stationed there. Iranian commanders are now threatening to strike directly at the United States if it moves to attack these fighting forces in Iraq. "If the U.S. forces target the Hashd al-Shaabi and Iraqi Islamic resistance forces, we will open the gates of hell to them," a Hashd al-Shaabi militant was quoted as saying, attributing the remarks to top Iranian General Qasem Soleimani, commander of the Iranian Revolutionary Guards Corps and its Quds Force, which is known to conduct terror operations outside of Iran’s borders. Meanwhile, Iran is denying that it requested a meeting with Trump on the sidelines of the U.N., reiterating multiple past statements highlighting the regime's opposition to sitting down with the U.S. in a bid to save the landmark nuclear deal. "Iran has not requested a meeting," Alireza Miryousefi, a spokesman for Iran's U.N. mission, was quoted as saying on Tuesday. Iranian President Hassan Rouhani has also taken multiple potshots at Trump, telling crowds in Tehran that Trump has been "begging" Iran to sit down for talks. "On one hand, they pressure the Iranian nation, and on the other hand, they send us messages through different channels every day calling for negotiations," Rouhani was quoted as saying at a festival in Tehran. In additional remarks aimed directly at White House official, Rouhani said, "Should we believe your softness in messages or your brutal acts? If you are sincere and like the Iranian nation, why do you want to exert pressure on people's lives?" Meanwhile, Secretary Mike Pompeo was heckled during a major address in New York City before the advocacy organization United Against a Nuclear Iran. Protestors, believed to be Iranian regime advocates, could be heard screaming "We're sick of you," before being removed from the room by security officials. Pompeo, responding to protestors, said demonstrations of this nature are not permitted in Tehran. It would be "a great thing if they could be able to protest like that in Iran, if they had those kind of freedoms," Pompeo said to applause. Continuing his remarks, Pompeo slammed Iran—which he described as an "outlaw regime"—for its international support for terrorism across the globe, including in America, where two alleged Iranian spy operatives were recently arrested for planning terror attacks on Jewish and Israeli facilities in California. Pompeo also responded to recent military threats issued by Iran, promising a devastating response to any Iranian-backed attack. "The United States will hold Iran accountable for any attack on U.S. interests and personnel in the region," Pompeo said. "We will respond against the source of the attack against American interests." This includes threatening behavior at sea in international shipping lanes, Pompeo said. "You can bet your last rial [Iran's currency] the United States will never stand for that," Pompeo said, referring to a series of provocative moves at sea by Iran on U.S. vessels. America is "making sure international waterways remain open to trade." This entry was posted in National Security and tagged Iran, Terrorism. Bookmark the permalink.